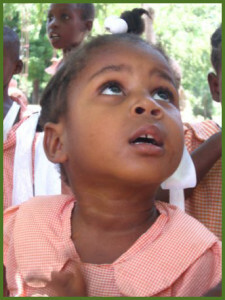 The Friends of HaiTi is a collaborative effort to support of the LaCroix New Testament Mission. Haiti is one of the poorest countries in the Western Hemisphere. More than two thirds of the people are unemployed and the average family income is $250.00 (US) per year. Our connection with the LaCroix New Testament Mission began in 1997, when Andrea Loether, a Pittsburgh area nurse, visited the mission along with gynecologist Dr. Dan Lattanzi to offer health care to a community that had never seen a doctor or nurse before. The first “clinic” was held under a tree using wooden benches as the exam tables and pharmacy. In 1998, Haitians and American mission workers built a medical clinic, which is currently staffed by Haitian nurses and a Haitian dentist. The medical clinic currently serves about 100 people each day and is open 5 days a week. A Birthing Center was also completed in 2007. The birthing center allows mothers to have a clean, safe place to deliver babies with the help of Haitian midwives or nurses. Pregnant women also receive pre-natal care and vitamins through the Birthing Center. Haiti does not have a public education system and most people eat only every other day. Seven mission schools provide education to 4,000 children. The Friends of HaiTi Child Sponsorship Program supports 140 children who are attending school through monthly donations from sponsors. Children receive their education, a uniform, and one hot meal each day. The LaCroix New Testament Mission serves about 15,000 people in the surrounding rural community. It employs 148 people, 56 of which are teachers. The church serves 1,300 Christians through worship, Bible Studies and Sunday School. The Friends of HaiTi is a non-profit organization, which insures that 100% of your donations go directly to the Haitian people. The goal of Friends of HaiTi is to work in partnership with the people through clean water programs, medical support, construction and educational programs empowering the Haitian people to improve their quality of life, within their own culture. We are dedicated volunteers who continue our relationship by offering financial support, education, medical care and hands-on support to serve the mission as well as informing Americans about the many needs of the Haitian people. We pay all of our own expenses for travel. All donations are used to benefit the Haiti People.